Whether it’s for a celebratory meal, date night or dinner with friends, nothing satisfies the way a well-made steak of high quality does. Of course, Cosmopolitan carnivores in Bangkok are no strangers to premium cuts of beef. Whether your cut is tomahawk, T-bone, rib eye or fillet mignon, there’s no shortage of meat-centric options for you to choose from in Bangkok. From classic steakhouses to Japanese and French restaurants, these smoking-hot places will satisfy your all meat cravings. When everyone has a different diet — with some not eating beef and others being veggie eaters — you can imagine how going to a steakhouse can be a real hassle. Well, let’s put the issue to rest by sauntering over to Primal Modern Grill. This Rama 9 venue has got everything from butter-basted steak to smoked chicken and refreshing vegan bowls like the Watermelon salad (THB 260). If the option-packed menu makes you feel indecisive in any way, we recommend going for the Herb crusted lamb rack (THB 690) served with creamy baba ganoush or the Primal Tomahawk steak, with the beef ribeye plated with truffle mashed potato and the pungent Tom Yum butter, priced by weight of course. There’s even a tempting range of soups, pasta, burgers, and elegant desserts. So, undoubtedly, this steakhouse is a true delight for omnivores, vegans, and vegetarians alike. 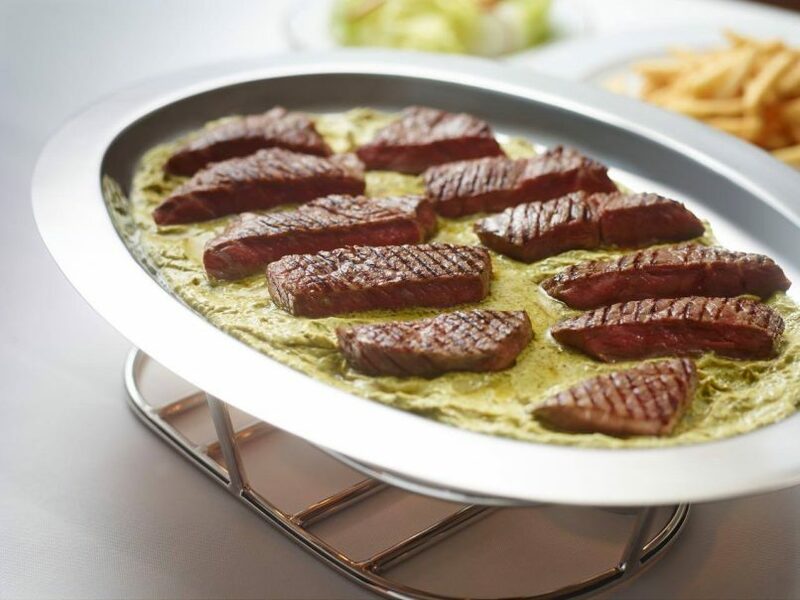 One of Bangkok’s steakhouse veterans, El Gaucho Argentinian Steakhouse offers grass-fed, free-range beef imported from both Australia and the United States. Conveniently, you can now find this Argentina–style establishment in three locations: Asoke, Nana and Thonglor. 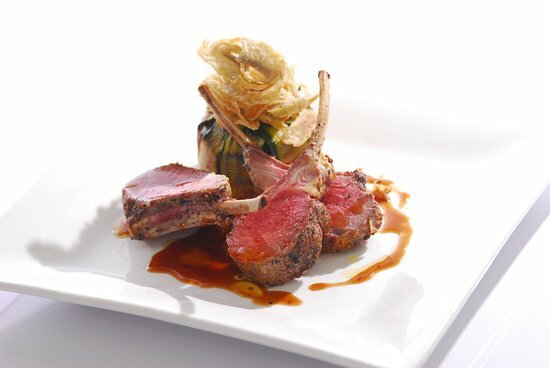 The restaurant boasts a wide selection of cuts, including ribeye, prime fillet and New York striploin, as well as a choice of lamb chops and lamb shank. If you opt for beef, we recommend their famed prime wagyu fillet mignon. To complete the experience, pair your succulent steak with a glass of La Posta Malbec from Argentina. 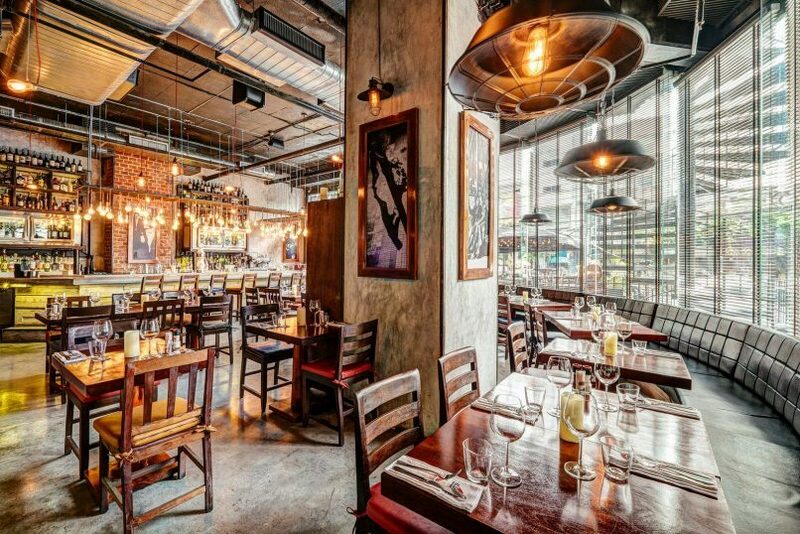 Parisian–style steak bistro Le Boeuf cultivates a cosy vibe with wooden furnishings and comfy leather seats. Completely detached from the Marriott Mayfair Executive Apartments, the restaurant is a standalone establishment with floor-to-ceiling windows, and it’s a modern meat shrine with French influences. For stellar starters, try their countryside-style foie gras terrine and pork rillettes. Of course, you’re here for one thing: the trimmed entrecôte steak with their legendary sauce, which is served with a side of walnut green salad plus unlimited golden frites. Let the Brazilian steakhouse be your steak coach. 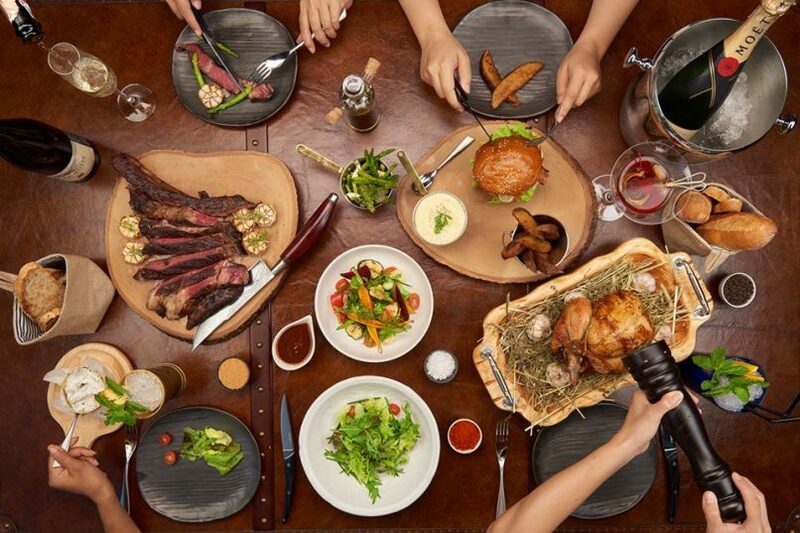 Distinguished from other venues, El Toro is Bangkok’s very own churrascaria, a traditional all-you-can-eat Brazilian steakhouse where they grill and skewer meat in the heart of the city on Sukhumvit. Enjoy an array of quality cuts of meat such as tenderloin, rib eye, pork rib, pork sausage, lamb chops and chicken sausage, all put on a metal skewer and cooked barbecue-style over an open fire. Watch you don’t drool too much when the server slices the smoking-hot grilled goodies before your eyes by the dining table. Hot and cold sides like feijoada, cheese bread, buttered rice, potato and garden salads are also included as part of the buffet to help lighten up the heaviness of the meal. A buffet for the adult is priced at THB 1,800. For kids under the age of 12, it is THB 900 but children below the age of seven will get to dine for free. Not up for the buffet? They offer a la carte too. A quintessential Chicago–style eatery nestled on the 19th floor of Hotel Muse Bangkok, Babette’s The Steakhouse offers not only prime cuts but also stunning skyline views. 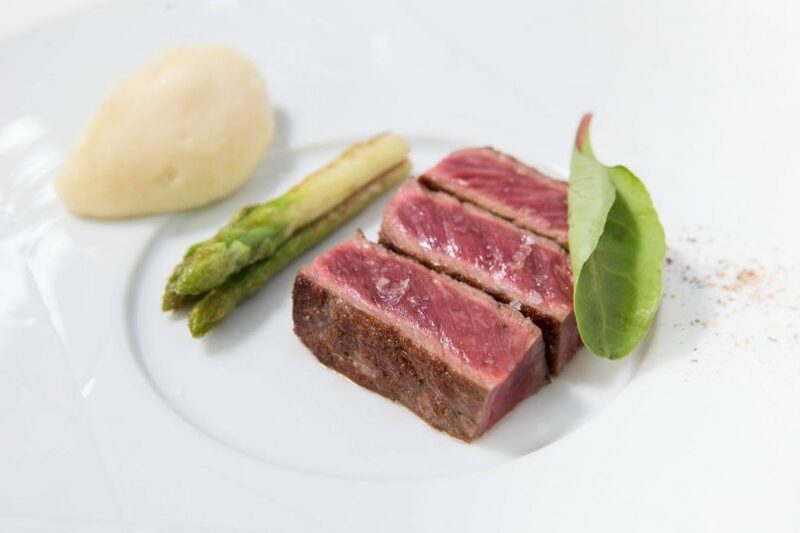 Main-event proteins include grain-fed Australian wagyu and Black Angus, Japan’s famous Kampo beef sirloin, and France’s Charolais beef. Here, you can order your grilled main with delectable sides such as Parmesan truffle fries and lobster mac and cheese. Don’t forget to pair the meal with a glass of luscious wine: Babette’s has a collection of Old World and New World wines for you to choose from. Arno’s Butcher and Eatery is Chef Arnaud Carre’s food enclave which offers a variety of dry-aged steak dishes which the venue is known for. Expect umami-packed dishes like the Rump steak (THB 790) and the T-bone steak (THB 590) with both cuts of beef dry-aged for 45 days straight. Due to this, the meat delivers such an intriguing dash of sour and salty tastes, making the flavour linger in your mouth even when the chewing is over and done with. Being the homage for high-protein concoctions, the venue also serves many Thai and Asian-inspired steaks and also boasts a butcher shop stocked with quality cuts like prime rib and beef tenderloin. First opened for business in 1969, Neil’s Tavern has turned out to be Bangkok’s staple steakhouse where generations after generations head to for a perfect plate of steak or charred seafood. Nestled along the leafy Wireless road, the restaurant boasts a repertoire of ultra-juicy steaks. Every piece of protein is grilled over medium-high heat which helps to tease out the best flavours of the meat. Try the French foie gras steak (THB 1,340) or the Bacon-wrapped filet mignon (THB 990). But don’t miss the Steak and fried king prawn (THB 1,280), which is a steak-meets-seafood dish showered in a generous serving of truffle sauce. Looking for an over-the-top dinner? Here’s where you’ll get it. Seriously, this steakhouse needs to make your week night or weekend dinner list. Why? They’ve got fresh ingredients, a fabulous setting and a fancy plating style which will enliven any night of your week. Helmed by restaurant mogul Artur Kluczewski who has years of experience in the hotel dining scene, this French-style rotisserie provides nothing short of hotel elegance and sophistication due to the fancy fare and sleek fine-dining scenario. The menu features grain-fed meat and whatever vegetable peaks during each season. Opt for the American prime Angus beef (THB 1,390) or the Tajima Kobe beef (THB 1,950) imported all the way from Australia. Pan-fried cut of organic pork chop (THB 570) is also available if you fancy pork over beef. Also, down some wines since the venue does offer a wide selection of opulent vinos. 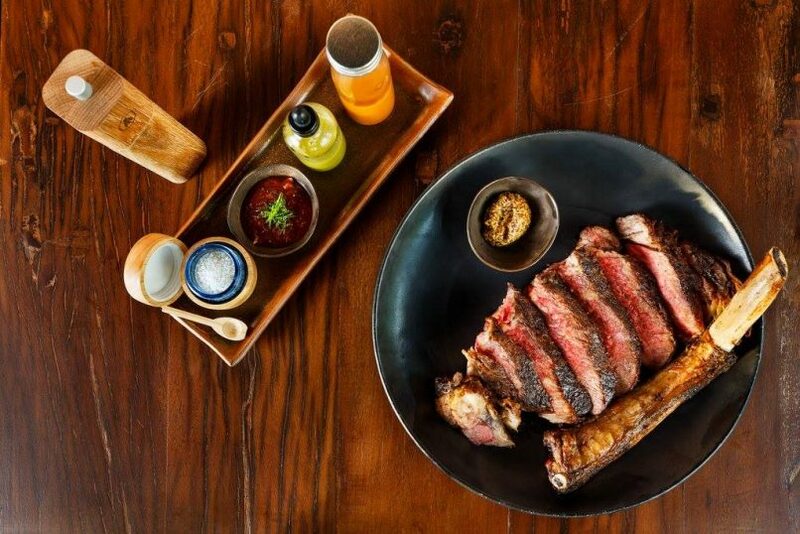 Since opening its doors inside the Intercontinental Bangkok, Fireplace Grill and Bar has been one of local meat connoisseurs’ favourite spot. 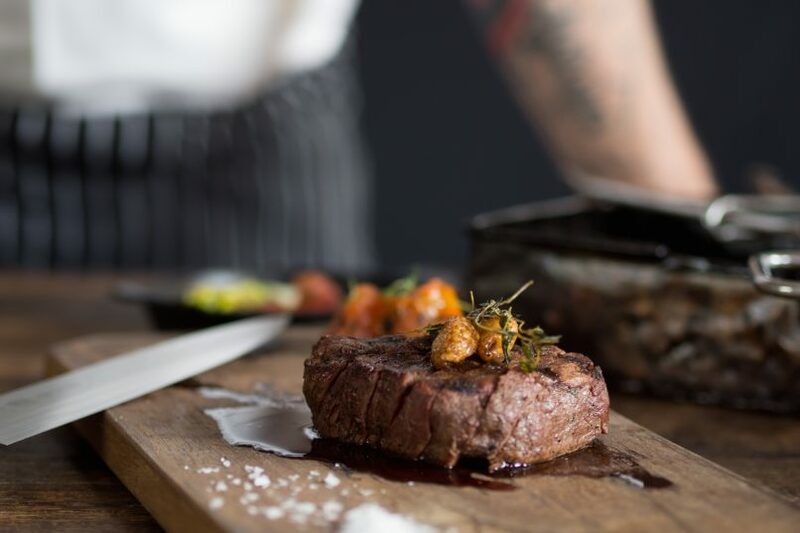 With an open-kitchen design and charcoal grills in the centre of the restaurant, Fireplace Grill and Bar stands out from the rest with an outstanding selection of superior cuts and seafood choices. Here, diners not only choose the type of steak they want, but also where it comes from: USDA prime strip loin from the USA, grain-fed Angus from Australia or olive-fed Sanuki wagyu beef from Kagawa prefecture in Japan. 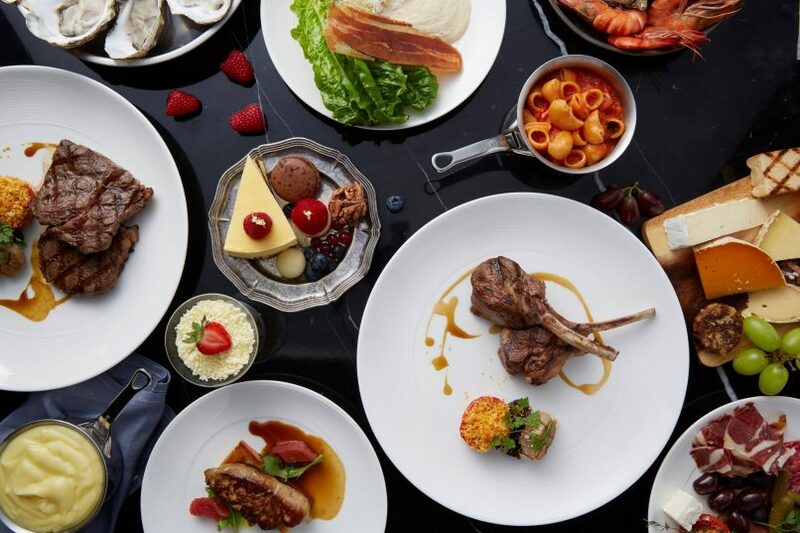 The Rib Room and Bar is an award-winning rooftop steakhouse within The Landmark Bangkok Sukhumvit, serving up exquisite meats and authentic French fare. 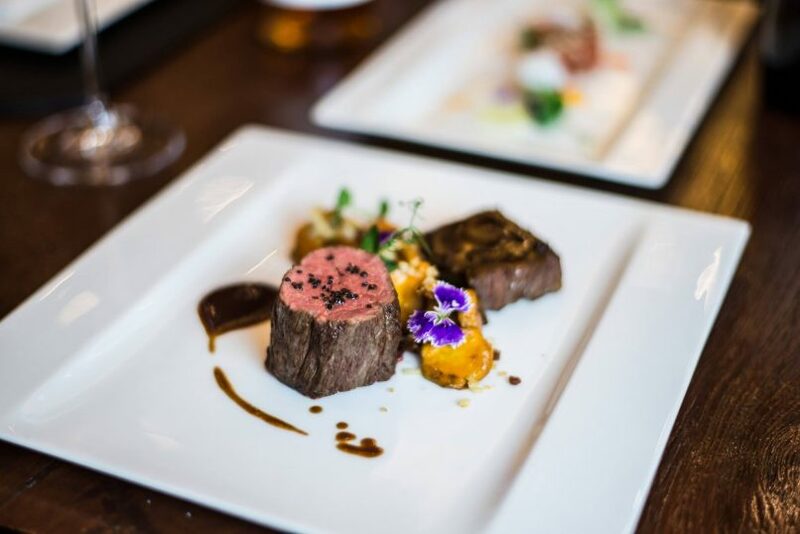 Here, the menu features Australian grain-fed beef tenderloin, British Hereford sirloin, and Japanese wagyu Ohmi beef, which is now ranked as one of Japan’s top three wagyu cuts. Select your favourite meat and pair it with a glass of premium wine to elevate the experience. Inspired by New York steakhouses, The District Grill Room and Bar is a sleek dining space furnished with dark oak, black marble and plush leather chairs. With an open-kitchen concept, you get to see the talented chefs in action, hopefully putting a glorious char on your steak. Don’t miss their special wine-pairing events from time to time, as they often invite Michelin-starred guest chefs and introduce exquisite, seasonal ingredients. For instance, they once featured Kampo wagyu beef, the product of lovingly nurtured cattle that were fed natural herbs in Miyagi prefecture. As a result, the beef gains a delectable marbling that literally melts in your mouth. Grilling just might be the ultimate American culinary art form, and New York Steakhouse at JW Marriott Bangkok is the perfect example. 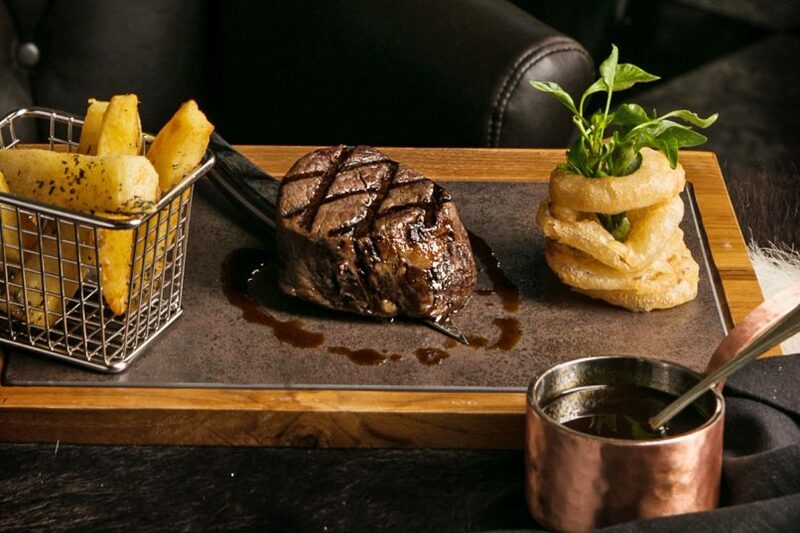 Since its opening in 1997, the restaurant has consistently delivered an indulgent choice of juicy steaks and seafood sensations, plus an outstanding wine list. The menu features USDA-certified prime beef; 300-day, grain-fed aged Australian Angus; and top-notch wagyu beef from Matsuzaka and Kobe. All the Japanese cuts boast a marbling score of 9 and 10, which are the rarest and most prized. If you’re keen on a substantial dinner for two, you’ll want to order the spice-rubbed tomahawk wagyu roast beef to share. 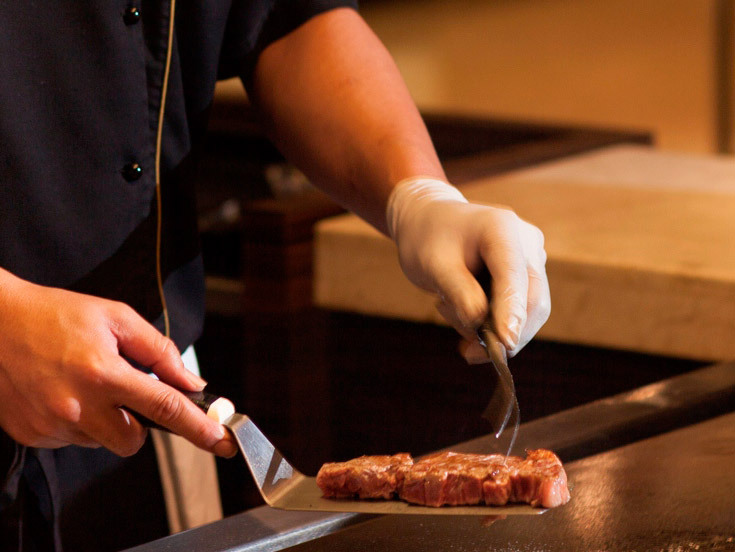 Superior quality meat is the priority at Nami Teppanyaki steakhouse. Here, you’ll be served the highest grade A5 wagyu beef and you can rest assured it will be cooked to perfection. Every dish is prepared on the teppanyaki iron griddle, and the best seat in the house is at the bar in front of the action. 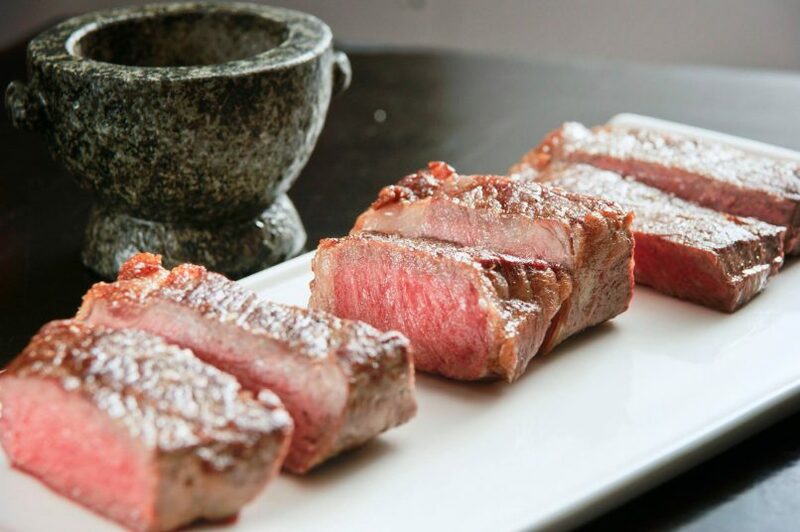 This premium beef comes from Tajima-gyu cattle in Hyogo prefecture, where they’re raised for 30 months of utmost comfort. As a result, the beef always boasts a marbling score of at least 8, and sometimes as high as 11. To appreciate the full wagyu experience you can order the multi-course menu, which includes a soup, salad, hot appetisers and dessert. A contemporary rotisserie that emphasises cooking on a wood charcoal grill, Cocotte Farm Roast and Winery’s farm-to-table concept focuses on the use of organic and sustainable ingredients. For instance, the restaurant supports the Royal Projects in Chiang Mai, and sources meats from free-range farms. In the menu, you’ll find a Australian wagyu tomahawk with a marbling score of 6, as well as melt-in-your-mouth, 48-hour slow-cooked wagyu chunk ribs. In addition to beef, the restaurant also does a fabulous roast chicken: Crisp and golden brown, the bird is marinated in chef’s special recipe and served with a sauce of your choice. Barbecue lovers, rejoice! Veteran French restaurateur Frederic Meyer has recently opened a new smokehouse barbecue joint named Le Cochon Blanc. With a giant blazing fire pit, the restaurant showcases an array of succulent meats such as barbecued ribs, pulled pork, and wagyu steaks. Here, you’ll also get to enjoy the relaxed dining vibe and their selection of drinks. At the bar, they’ve got classic cocktails, craft beers, fine wines and also Japanese sake. It would be a mistake to pass up their thick-cut fries, which are cooked in dry-aged beef fat. The name Il Fumo literally translates “the house of smoke” in Italian. And just as its name suggests, this refined steakhouse is about two things: contemporary Italian cuisine and wood charcoal grilling. The meat selection features prime cuts from Galicia in Spain, Chianina beef, Australian wagyu, and French Limousin. Portuguese-born head chef Nelson Amorim, former chef at three-Michelin-starred Otto e Mezzo Bombana in Hong Kong, has a gift for combining fresh flavours and transforming ingredients into edible art. Every single dish here is not only outstanding in taste but also extremely Instagram-worthy. Lady Brett Tavern is a casual neighbourhood spot that focuses on simple comfort food, especially the kind cooked over a charcoal barbecue. Black leather banquettes, a lacquered dark-wood cocktail bar and herringbone-patterned floor tiles decorate the space, but it’s really the on-site curation of quality meats that speaks to the restaurant’s strengths. Lady Brett delivers beautiful cuts of beef, like a 1.3-kg tomahawk steak, Black Angus rib eye, and braised beef cheeks. Delectable sides include a ratatouille, spicy miso eggplant, and truffle and sour cream mashed potatoes. A newcomer that just opened its doors last year, CHAR Bangkok is a contemporary grill plus rooftop bar. 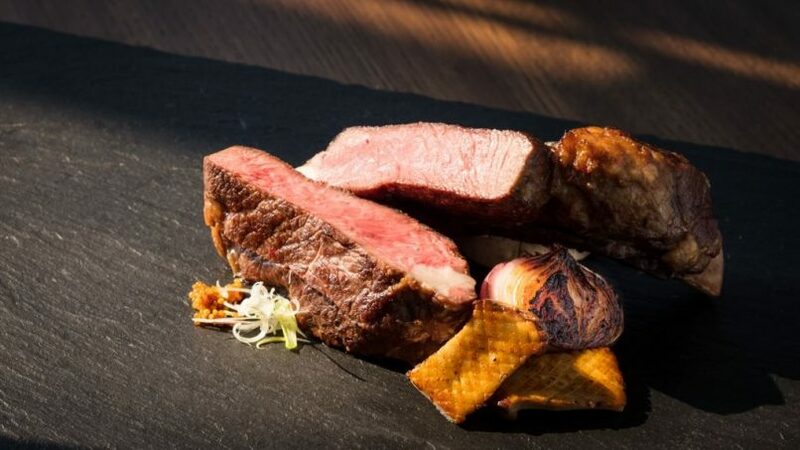 The selection features dry-aged Black Angus prime beef from Australia, grass-fed Caviness beef from USA, and authentic Kobe wagyu beef with marbling score of 9. If you’re looking for a romantic, upscale dining spot for two, CHAR is a good option, as there are plenty of quiet corners with stunning views. Order an Australian tomahawk or the surf and turf option to share, and savour the dramatic skyline vistas and stylish sips at the bar afterwards. 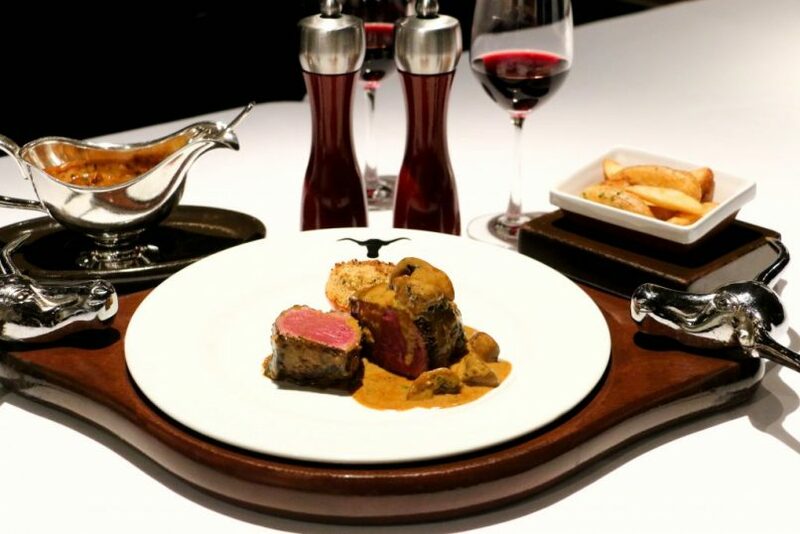 There are certain things you expect when dining out at a steakhouse: top-notch service, pleasant atmosphere and an excellent selection of meats and wines. All of the above is true of Madison, the contemporary steakhouse nestled within Anantara Siam Bangkok Hotel. The restaurant is now a neighbourhood staple that’s been known to lure its share of passersby to its tastefully modern dining room designed by Tony Chi. Here, steakhouse standards rule the menu: Black Angus prime Australian beef, grain-fed wagyu tomahawk and grilled lamb chops. Enjoy the cosy lounge setting and savour a cocktail before you go. Food is literally theatre at this teppanyaki restaurant inside AVANI Atrium Bangkok. 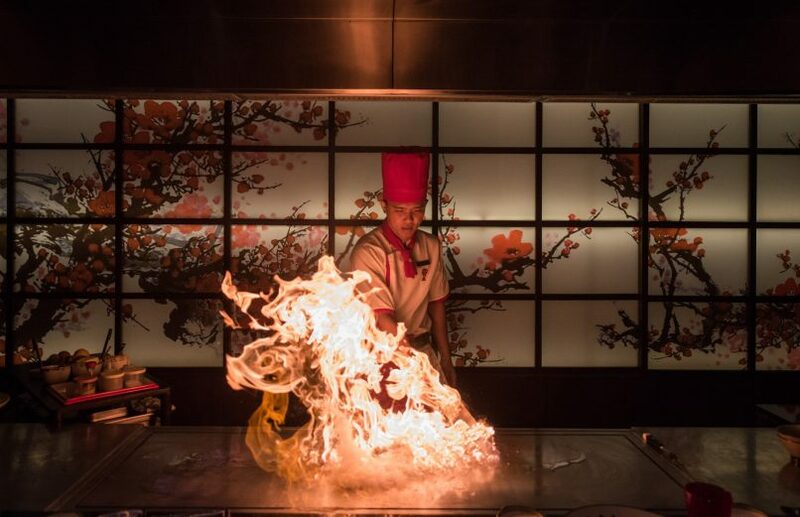 Meals are played with and prepared on a teppan iron hot plate, where chefs showcase knife skills, tricks and flicks as they prepare your meal. The menu ranges from appetisers and sushi rolls, as well as a selection of exquisite meats. The cuts include A5-grade Japanese Kagoshima striploin, A4 Hakata wagyu rib eye, and Australian Black Angus tenderloin. Keep an eye out for lunch offers and bento boxes, too.